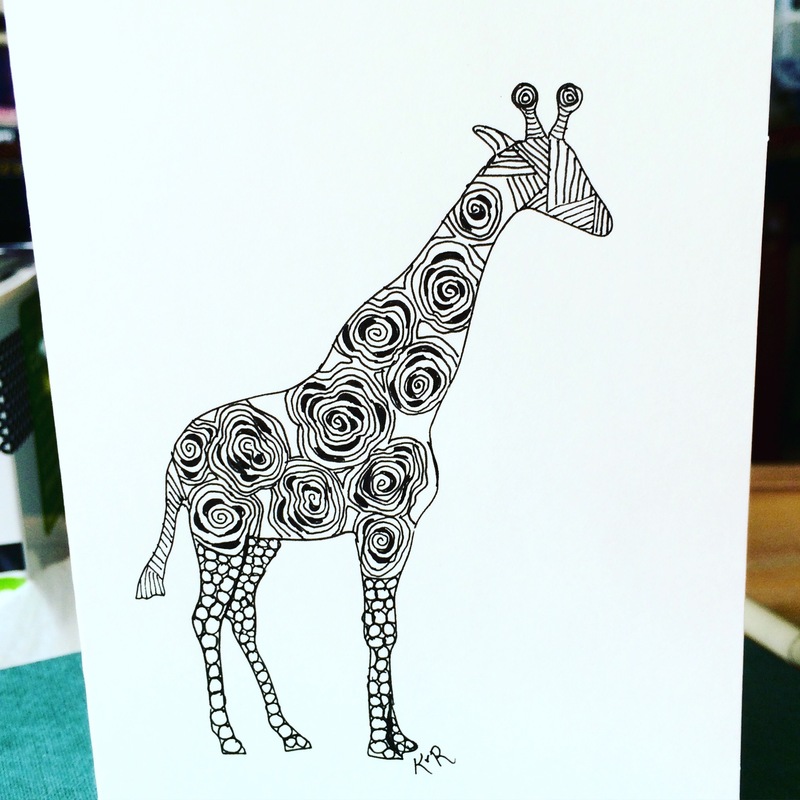 Posted on September 2, 2015 by Kat, aka "ArtyKat"
Well, the Celebration of the Arts took place on Saturday, and I’ve been busy ever since! Tamara and I had a great time sharing her space – she was so kind and gracious. We had taken our two tables and a box of things for the tables to her office on Friday night. We didn’t hear Bear’s alarm go off (did it?) Saturday so instead of being there by 7:30 to open at 8:00, we awoke at 8:30! Groan. When I messaged Tamara to tell her, she asked if we wanted her to set up for us! Yes, please! What a sweetie. Bear and I sold about six of my many stones (mostly turtles), and that was all for day. But our good friends who happen to be neighbors came to our booth (brightest spot in our day! 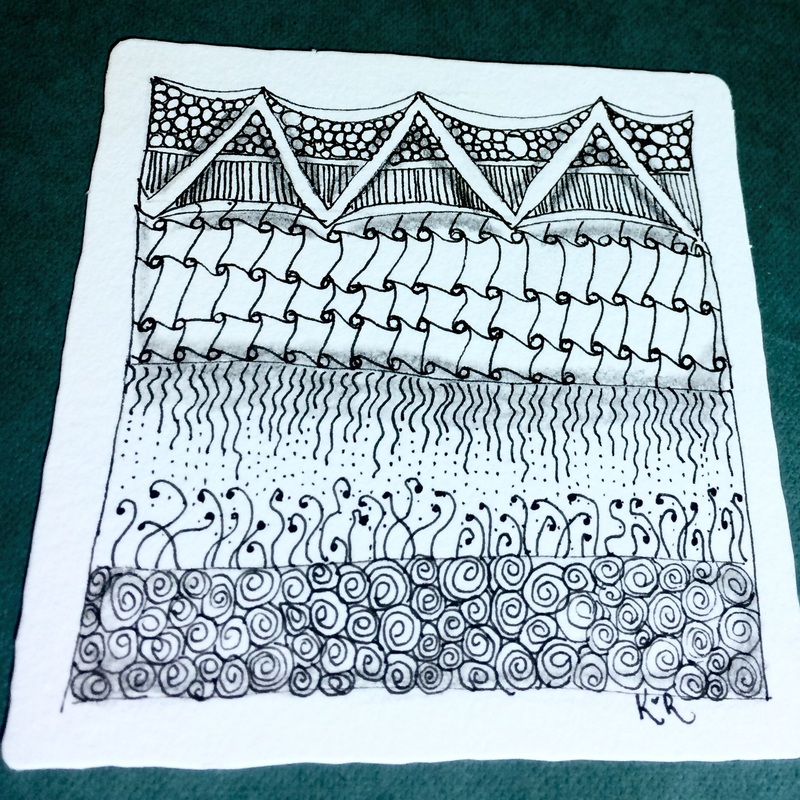 ), and the woman of the couple picked out a picture… And bought it! Yay! 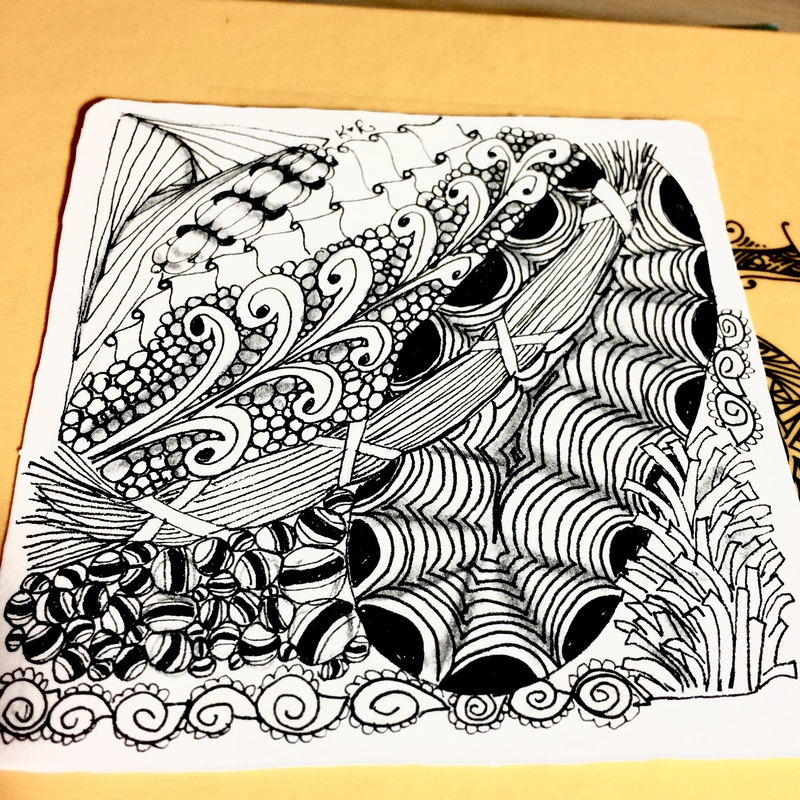 When I got home, I got a call with a big order from someone in Florida who had seen my work online. He ordered five items for Christmas gifts! A good friend from junior high contacted me and also put in a Christmas order. I am enormously blessed! And busy! Just the way I like it. Without further ado, here are recent works for your approval. Seriously, do leave a comment and/or a “like” to let me know that you came by. Click on the picks to make them larger. Also, if you like something let me know, as it is all for sale. 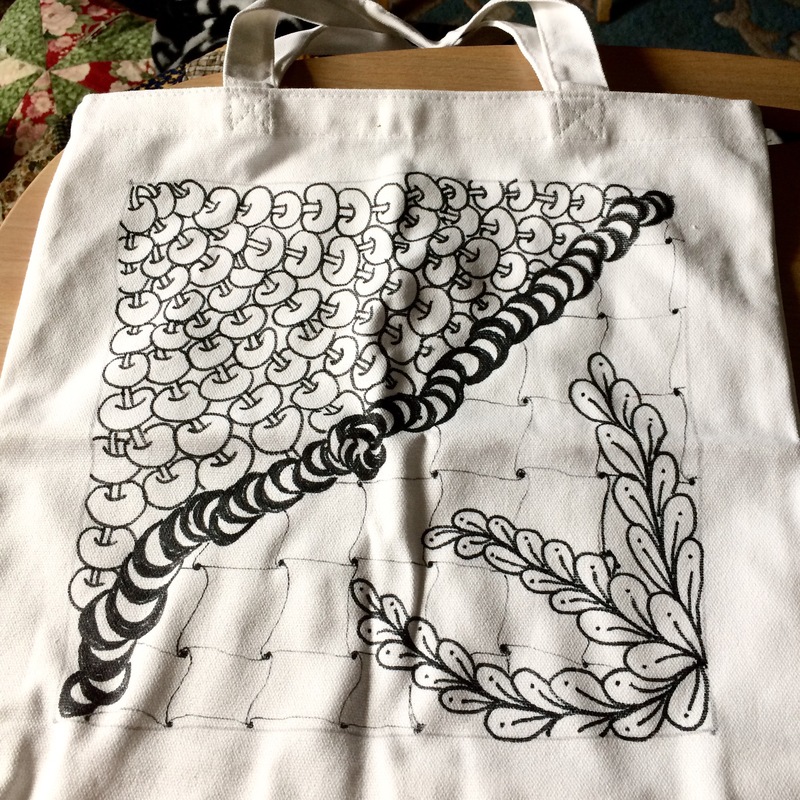 this is a tote bag that is approximately 13.5×13.5×3″z it is original one_of-a-kind art. Can be washed by hand, sparingly. 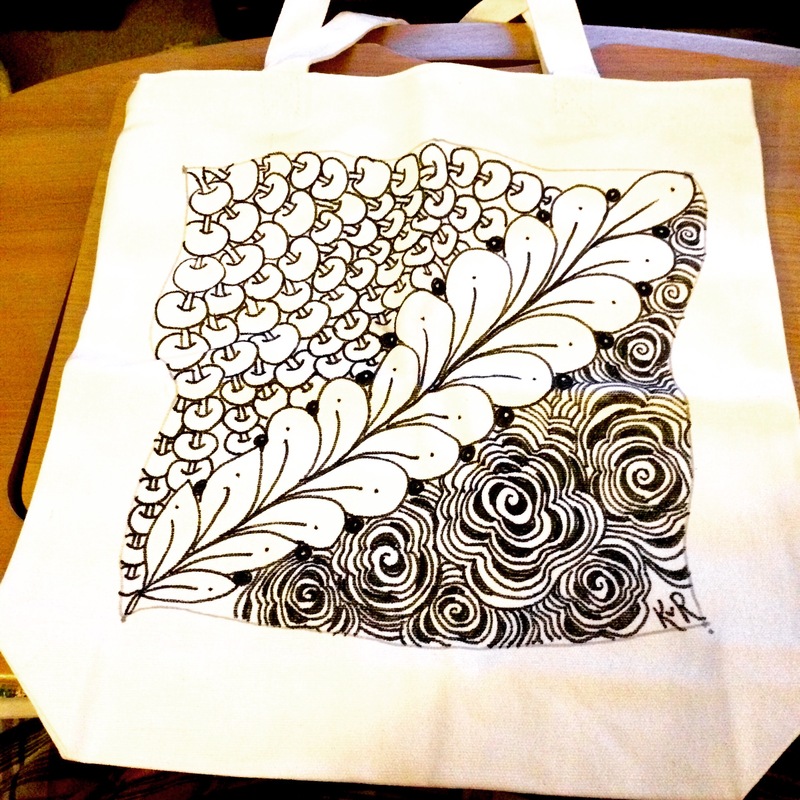 This is another tote bag that is approximately 13.5×13.5×3″z it is original one_of-a-kind art. Can be washed by hand, sparingly. 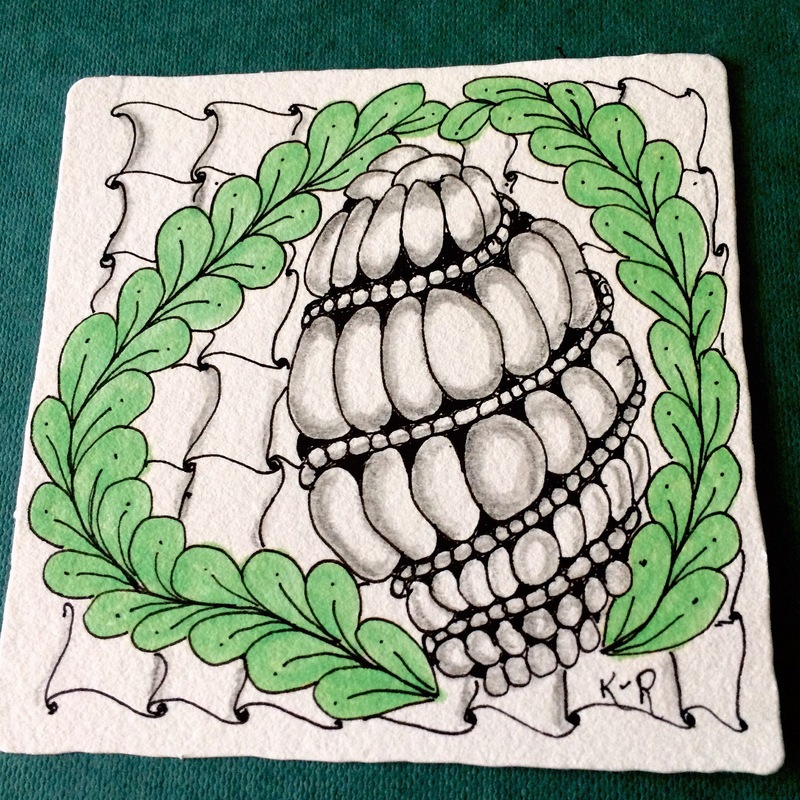 This is an original Italian paper tile, using archival ink. 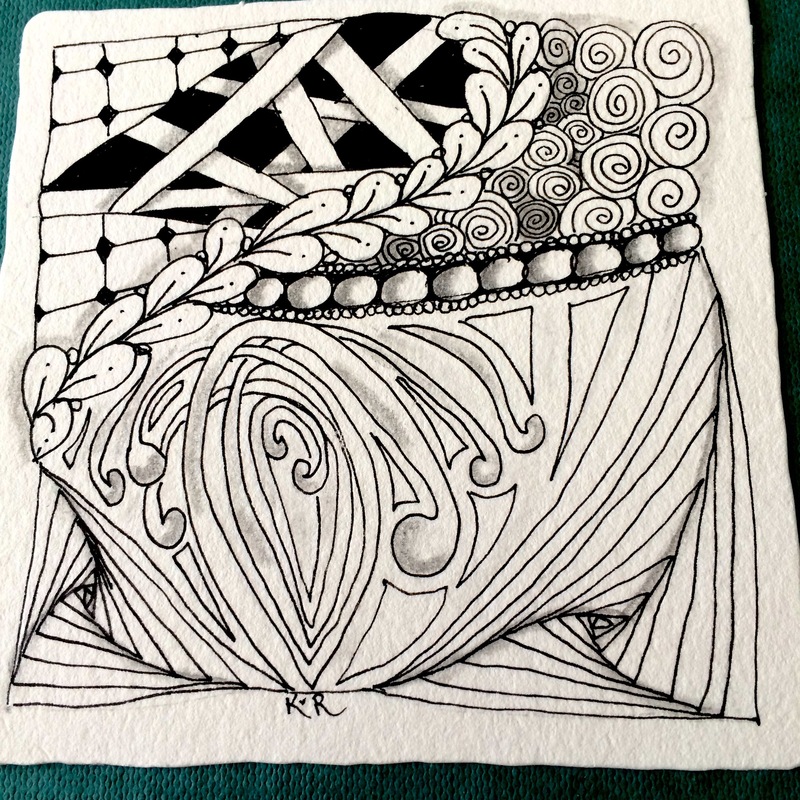 It is 3.5 square and comes with a frame or small easel. 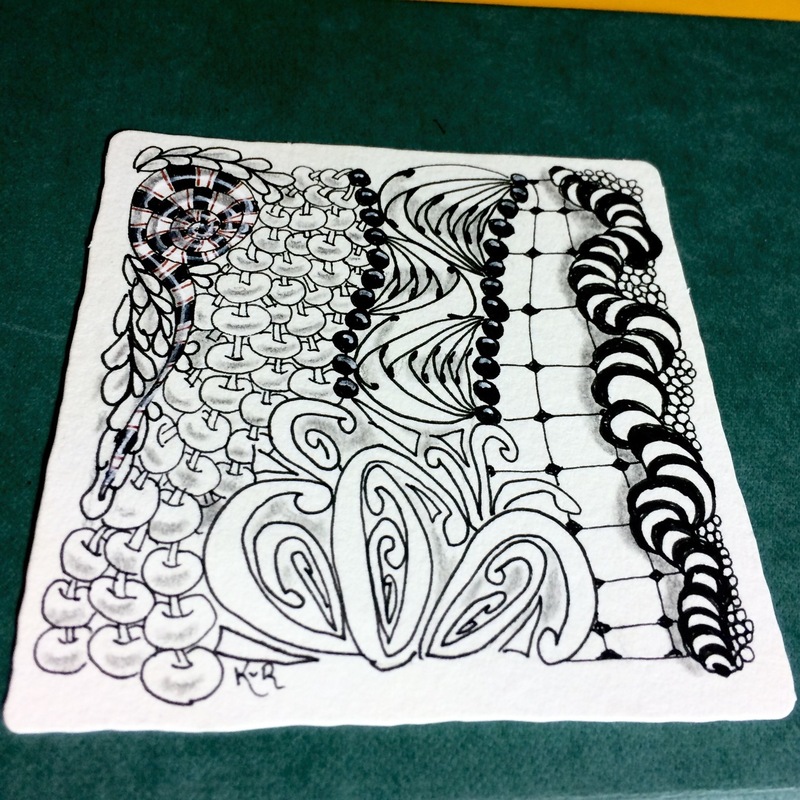 another tile, same as above. 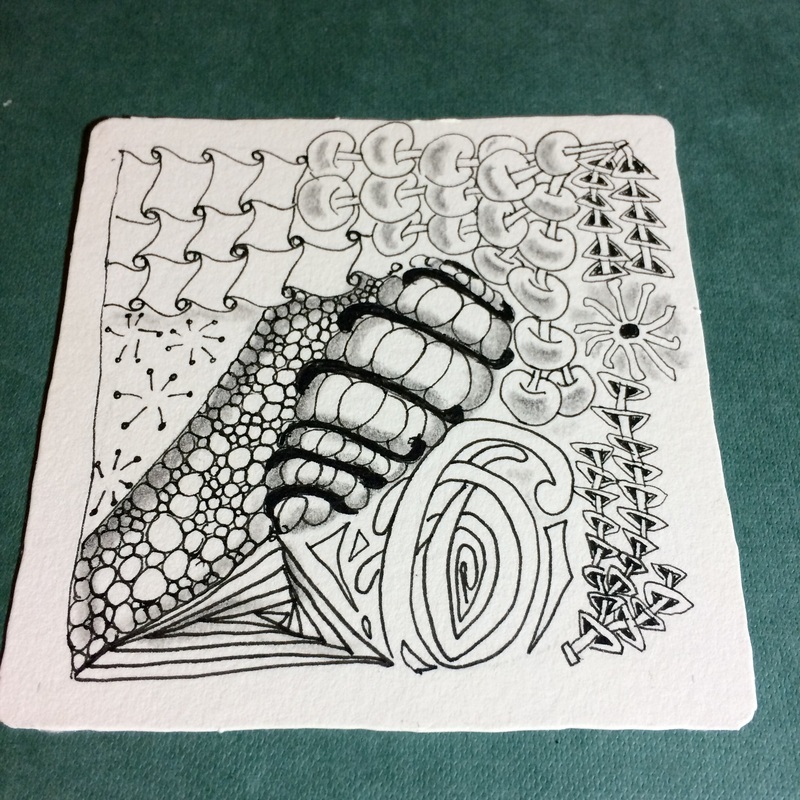 Another tile made with a thick Italian mould paper. 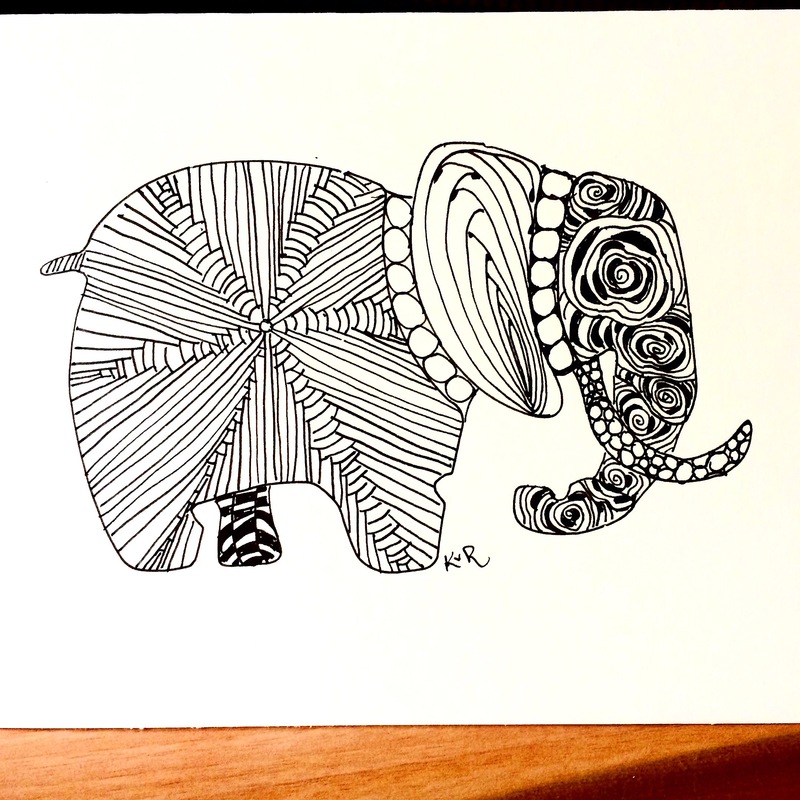 Another notecard, this time an elephank. 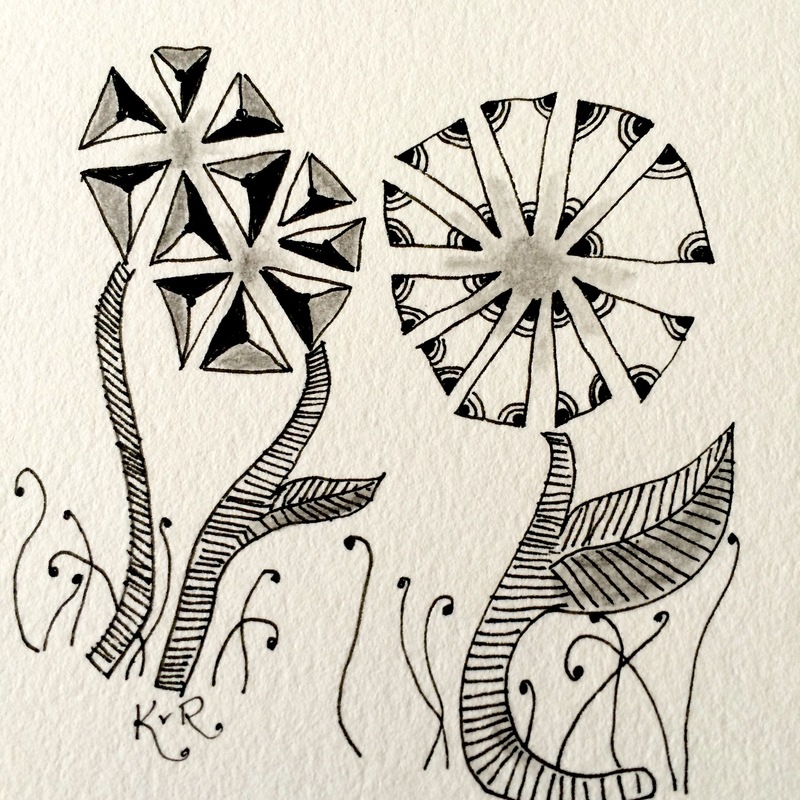 I hope your days have been peaceful and creative. 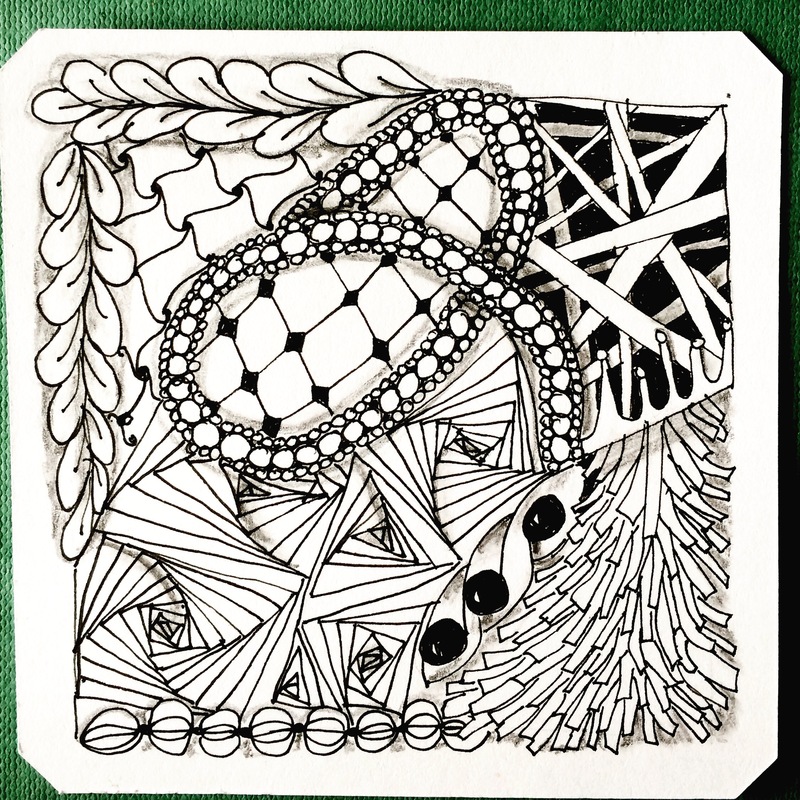 Posted on July 31, 2015 by Kat, aka "ArtyKat"
This is the Tangle I made for my son yesterday. 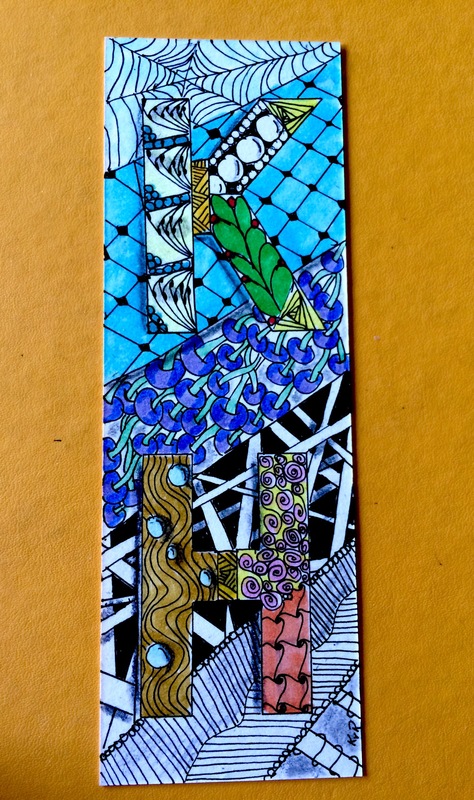 It’s on a notecard 4.25 x 5.5″. Hope your day is full of beauty and creativity! 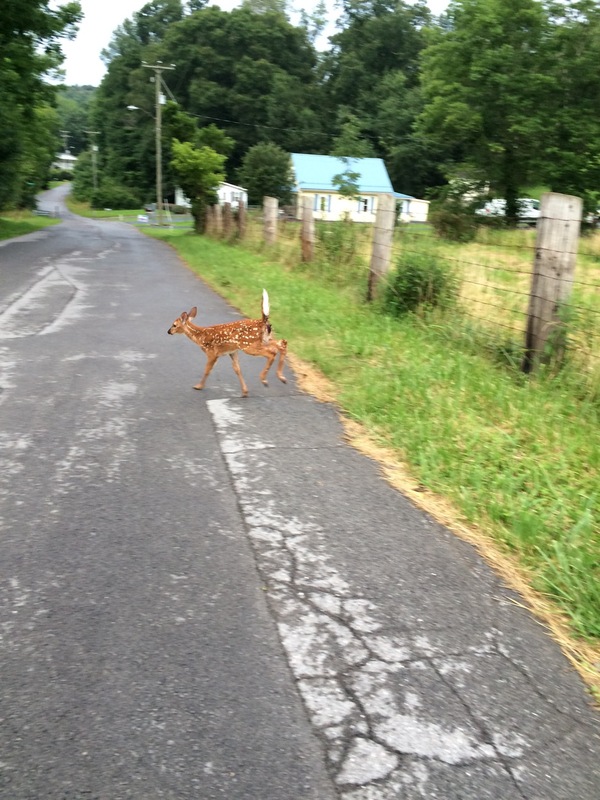 More Art and a Fawn, too! 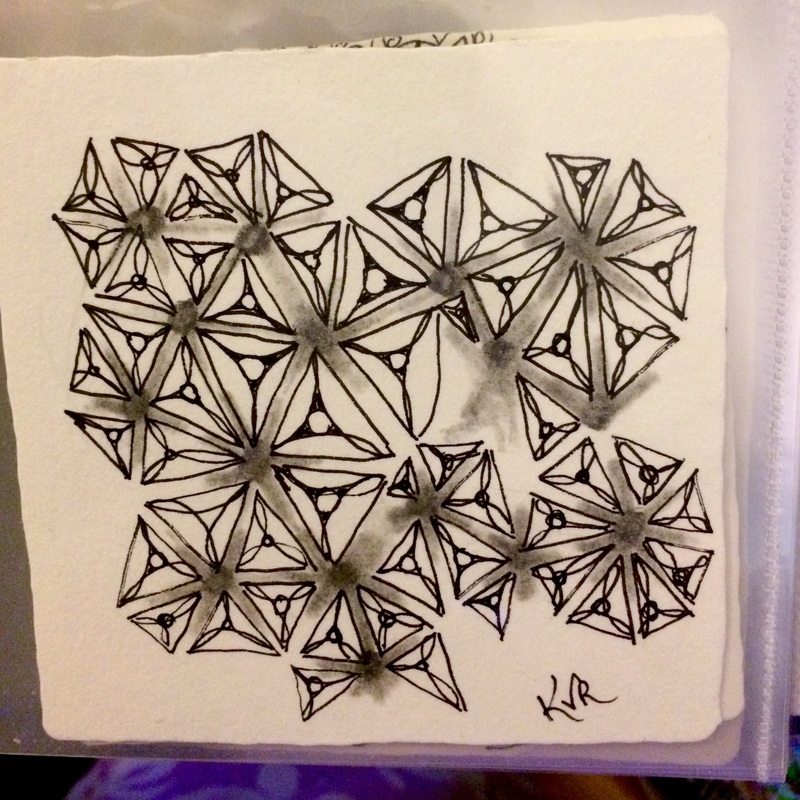 Posted on July 21, 2015 by Kat, aka "ArtyKat"
i have more art to share with you. 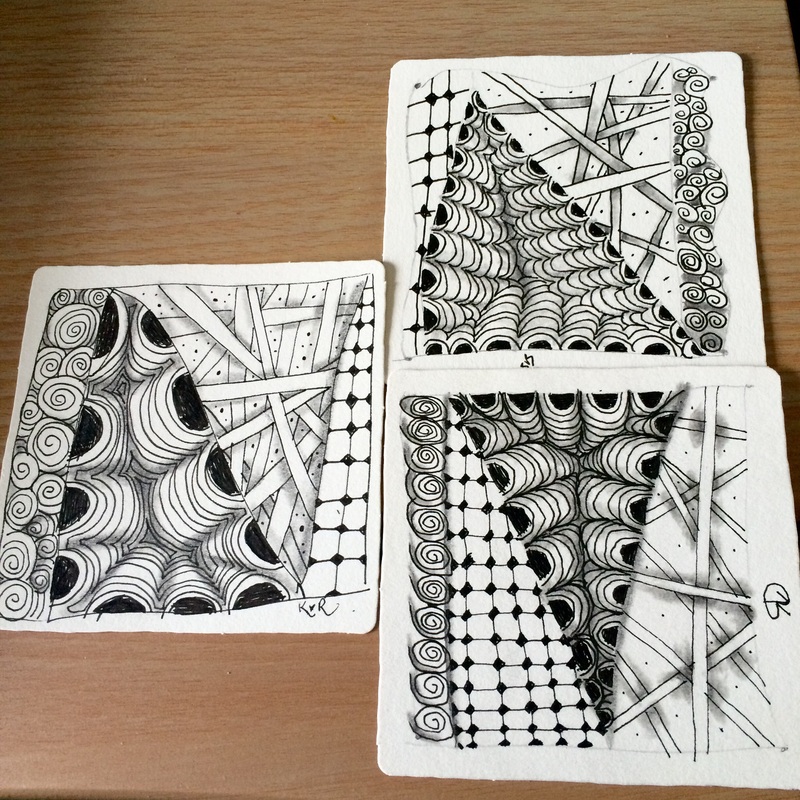 I’ve been busy preparing for my Basic Zentangle 101 class on Saturday. Glad I have a few more days to prepare. So far as I know, it will be a small group which I find more intimate and better for the student. They get more attention and that’s nice. It’s been raining here at least once a day for a couple of weeks, as well as being in the mid- to upper 80s, which makes for a very humid (miserable) day. I like it best when I get to go outdoors and go for a drive in my chair with Bella. I always find some wildlife to photograph and Bella can use the exercise. 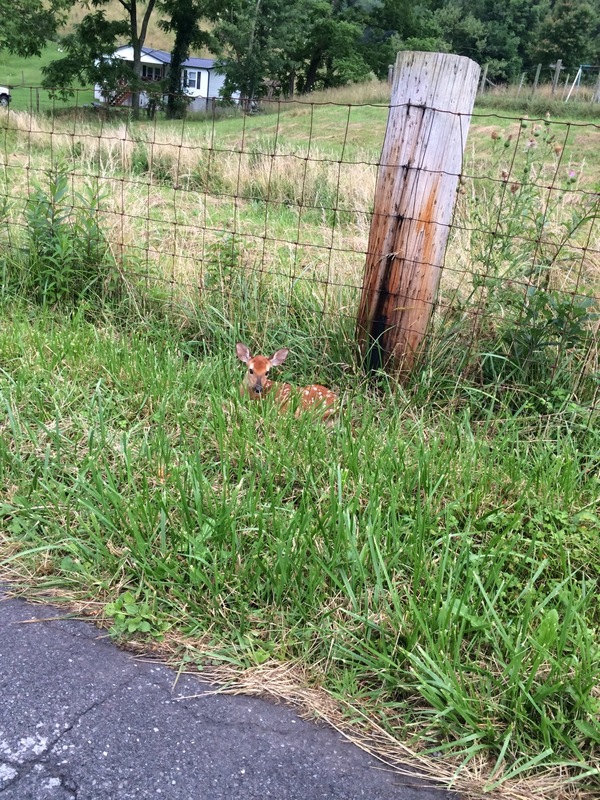 Yesterday, I came upon-almost literally!- a very young fawn just sitting in the grass inches from the road. I could have touched her, she was completely u afraid of me even when I spoke to her. She startled, however, when Bella barked! So did I! All I had with me was my phone- last time I go out without my “real” camera! 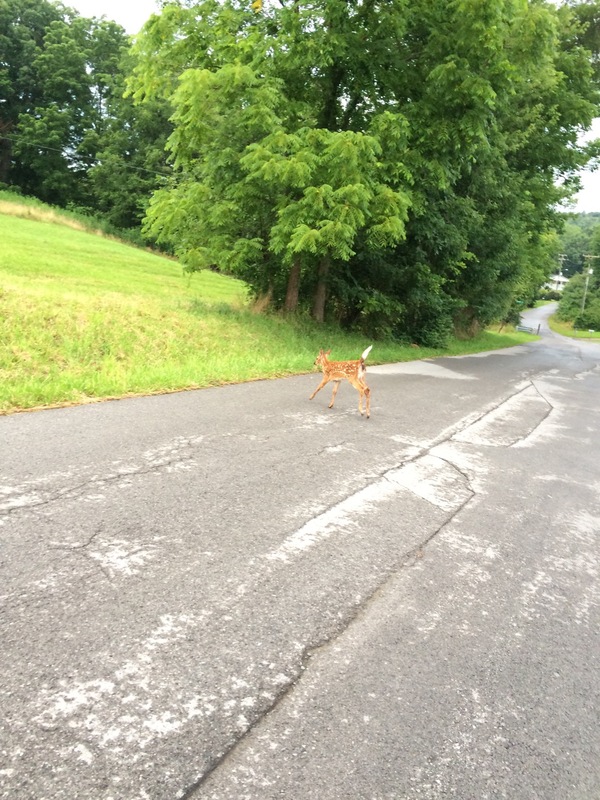 a bark and she’s off! And now for the art! Take care and be creative- you’ll feel better! 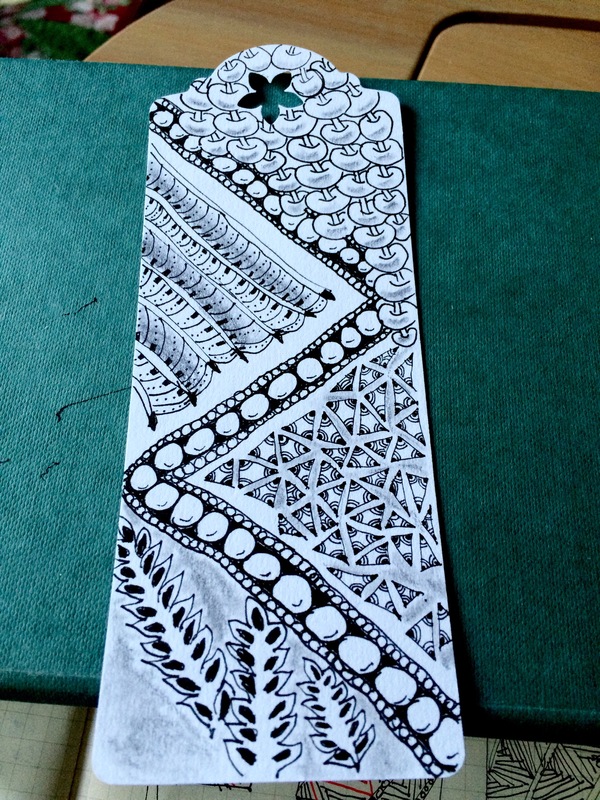 i tangled a bookmark today. It’s white but looks light blue for some reason! i enjoyed this new shape! Now I wonder what the best thing to do is: use Mod Podge or a spray fixative! It isn’t the thickest paper card stock. 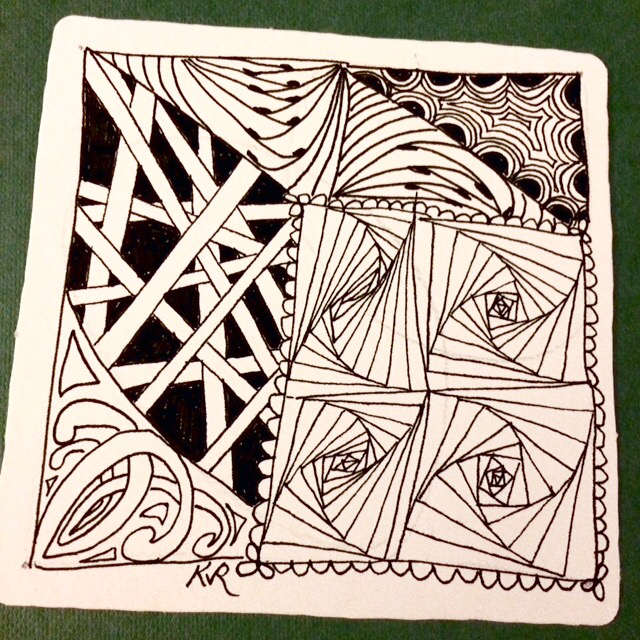 Posted on July 8, 2015 by Kat, aka "ArtyKat"
and no time tonight in which to do it! I attended the CZT Training in Providence Rhode Island and would go back in a heartbeat. It was absolutely magnificent and met the needs I had and many I didn’t even realize I had! 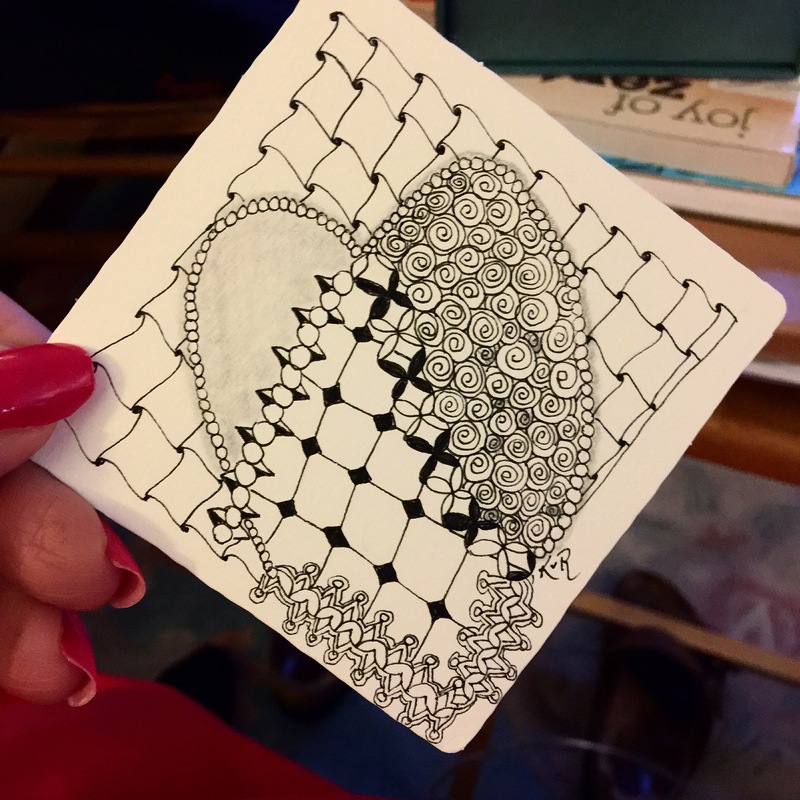 I sent a few photos with it as my friend, the recipient, has no computer and has no idea what Zentangle is. 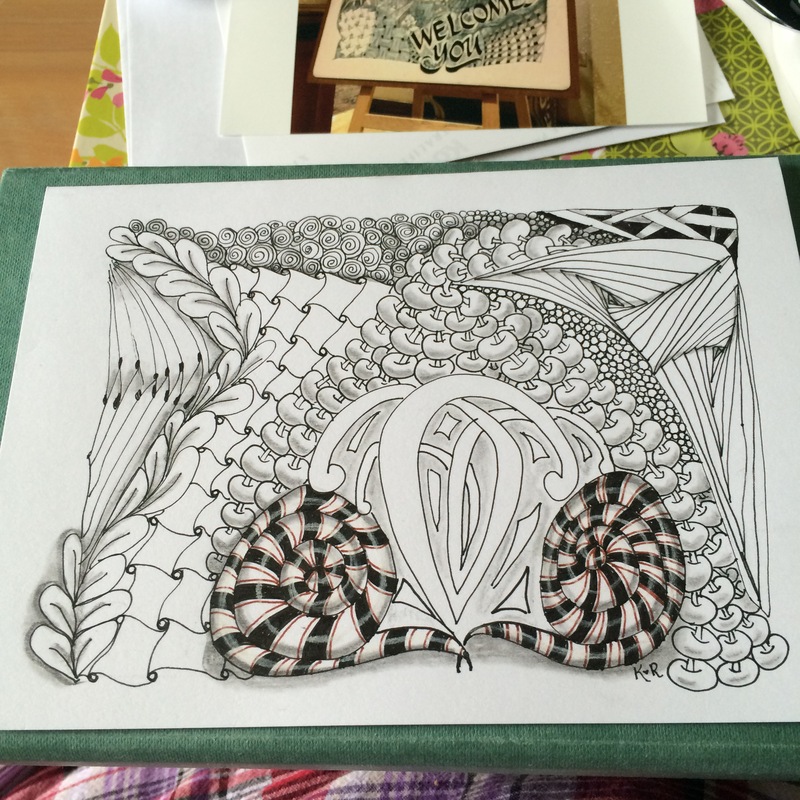 Still Drawing my HeART out! 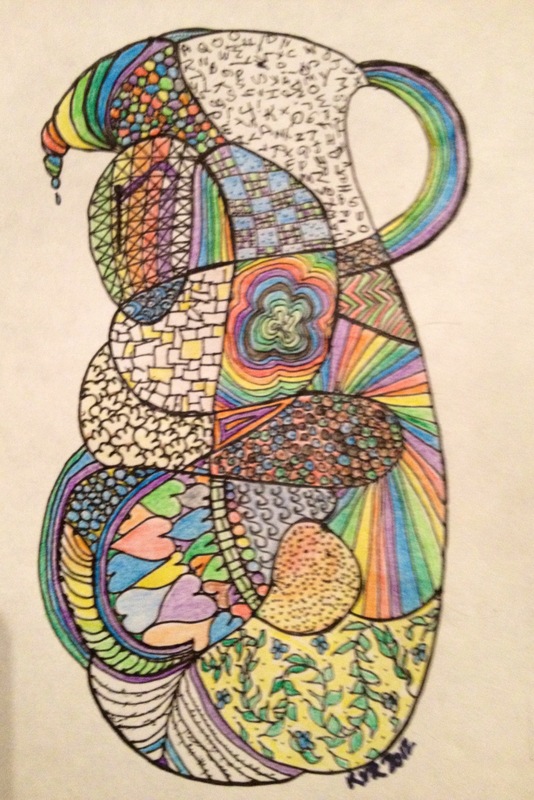 Posted on April 18, 2015 by Kat, aka "ArtyKat"
﻿ ﻿a whimsical teapot! 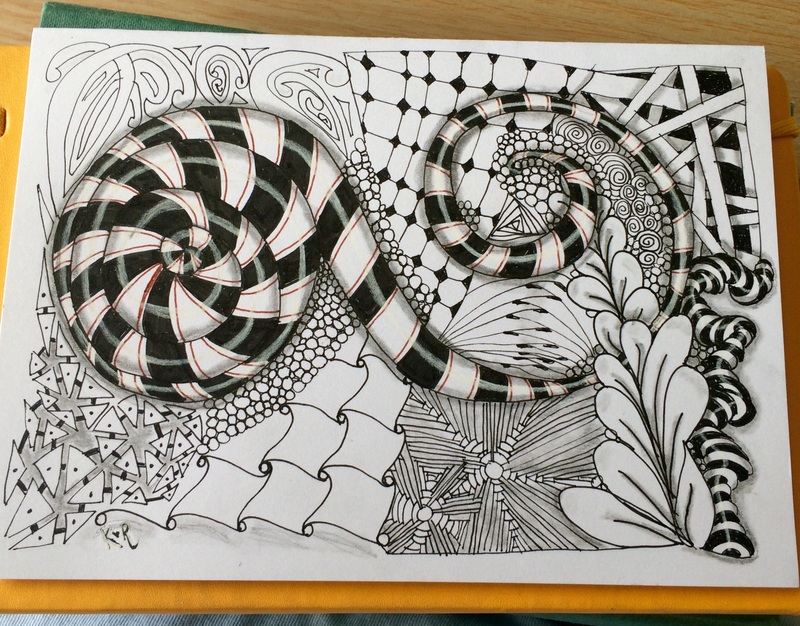 I started this with no plan whatsoever but after making th pie-like “slices” I was off! Wish I could have a cuppa! 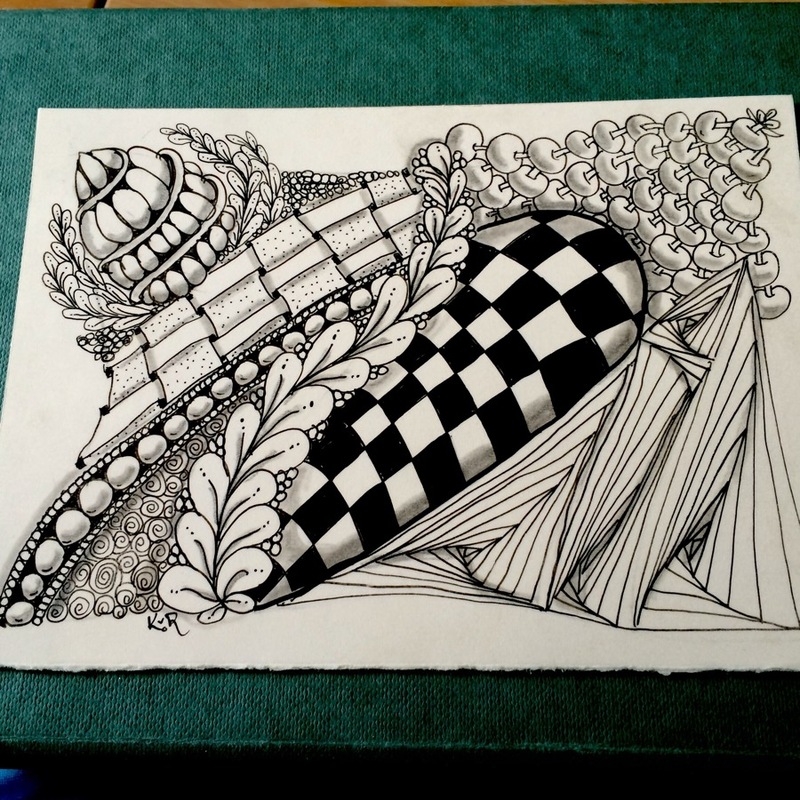 This is another drawing I wanted to throw away but my husband insisted I not do so.